Perth is a city to explore the parklands, clean beaches and popular precincts, as you enjoy the relaxed ambiance, while enjoying the seafood. Visit the city this April to attend some of the most exciting events lined up. 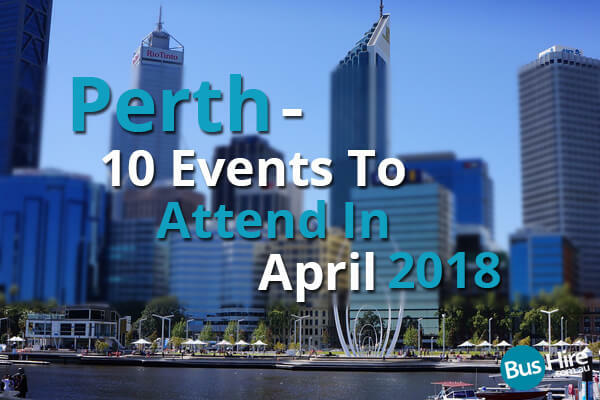 Choose Perth bus hire to conveniently access these event destinations! Easter Sunday is not all about fluffy chickens, bunnies and chocolates; it is certainly more than that. This is why we have the Perth Parade on the 1st of April to help you remember Easter for a long time. Join people from all over the city as they come together to remember the resurrection day. The parade will commence from the Stirling Gardens in Perth to Wesley Uniting Church. This vibrant parade will feature a whole heap of balloons, live performances and lively music. Join the celebrations as you fill the city streets with cheers all along the way. The National Youth Week is returning back in 2018 to Perth, with an extensive line-up of events from 5th to 26th of April. There will be heaps of competitions and activities throughout the course of the week. The official opening is on Friday, the 5th of April at the Youth Hub in Northbridge. This will be followed by a Kickstart Festival on the next day, featuring workshops, bands and youth markets. People with disabilities can also take part in activities such as a wheelchair-access flying fox and abseiling. Give yourself some time to rejuvenate and relax, as you go on a weekend yoga retreat from 6th to 8th of April, under the expert guidance of Sue Byrne. She’s an experienced instructor who has attended training sessions in Australia, USA, Bali and India. Through practices of yoga and meditation, she endeavours to inspire and empower students to develop balance in their lives. The idea is to feel amazing, while also increasing your strength and flexibility. It’s a great opportunity to meet like-minded people, learn something new and deepen yoga practice. This widely popular night Market turns Axford Park into an active village fest with loads of kids entertainment, live music and an exciting array of street food stalls. Entry is absolutely free every Friday, till the 27th of April, with the fun kicking off at 5 PM with some of the best food vans, trucks and vendors serving some delicious and affordable food. You are certain to taste original dishes from all partners of the world, with some freshly prepared snacks as well. Some of the favourites include Zab Salad, Rancho Sombrero, Shak Shuka, Kamals Quarter, T Sisters and El Argentino. Neil Diamond is one of the best musicians of all time, who had immense interest in music from an early age. He has regularly toured the city of Perth during his long career, and this year he’ll be making an appearance at the Sandalford Winery on the 14th of April. It was in the year 1966, when he recorded his debut album featuring hit songs like Cherry and Solitary Man. In 1971, he signed a whopping contract, after introducing a British star, Elton John. In spite of being shy of the cameras, he has appeared in some films, with the latest one being The Jazz Singer. The annual Karijini experience is best known for its sceneries, food and music. Happening from 17th to 22nd of April, the event is all about celebrating culture with music revealing the indigenous heritage of the region. Currently in its 6th year, the event has grown in standard over the years and has attracted nomad travellers in big numbers. Located in the heart of Pilbara, this place will require some sort of planning to get to. But once you make the trip, you are sure to return with rich memories of Aboriginal culture, food and music. The 3-day extravaganza starting 20th of April promises to be packed with entertainment, music, art and camping, as you experience amazing folk and roots at the Fairbridge Festival 2018, the most popular camping festival in Australia. This immersive celebration of Celtic, acoustic, roots and blues will take place in Fairbridge Village, hardly a 3-hour drive from Perth. Last year’s event was a phenomenal success, being the 25th anniversary of this amazing festival packed with local as well as international artists. This epic, all-new outdoor event is coming to the city of Perth on the 22nd of April taking inspiration from the breakthrough ramp technology and game-changing progression, with Travis perfecting it at the Nitro World Games. He is an American stunt performer and professional motor-sports competitor, who has won gold medals and championships including Rally racing, Motocross and Supercross. Expect some captivating action as you see the motor vehicles flying everywhere in pure wrath. Starting 23rd of April, the Perth Comedy Festival is a must visit event for anyone who appreciates good sense of humour. There will be an extensive line-up of comic actors and comedians performing throughout the course of the month to ensure that each individual will leave the venue with a smile. Some of the biggest names taking part in the event include the likes of Alice Fraser and James Valentine. Enjoy interactive and funny nights, as you laugh your way through some of the most hilarious acts, performed by stunning talents. What’s On at Koorliny Arts Centre in 2018? With an exciting performance season on schedule, the Koorliny Arts Centre is all geared up to entertain you with professional shows, morning melodies and stage programmes. Over the years it has emerged as one of the leading community venues in Western Australia. There will be 3 stages of the season, including Rock of Ages, Murder on the Nile and End of the Rainbow. Audience can expect rocking live entertainment, one after another in a show built around music and big hair.